Keep reading for some simple techniques to get your fans more involved. Even if you’re active on your Facebook page’s wall by posting regular status updates, interacting with fans and answering questions, you’re still missing out if you aren’t using calls to action. A call to action encourages or even incentivizes fans’ responses to your content, and it can be as basic as a simple status update. Your fans will enjoy interacting with your Facebook page and your page will benefit the most with increased visibility, traffic and marketing opportunities. Many Facebook page admins aren’t quite sure how to foster an active fanbase, so here are five effective ways to call your fans to action. You want to get your business in front of your fans. But how do you do that? Too many page admins resort to posting the same status updates over and over as a solution. But in the long run, that technique becomes annoying to fans and it doesn’t play to the power of EdgeRank. EdgeRank is the algorithm Facebook uses to determine the importance of a status update. The more comments a status update receives, the higher its EdgeRank. The higher the EdgeRank, the higher that update is placed in news feeds. In addition, Facebook will display that update to more people. This means getting comments should be your goal with your status updates. To get more comments, tailor your status updates to ask for your fans’ opinions, stories and even advice. 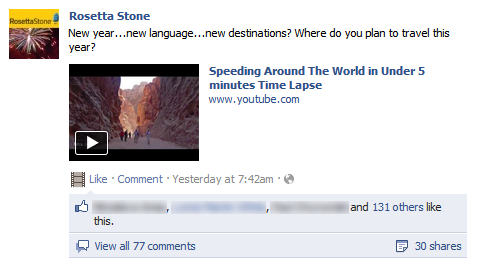 The comments will float your post to the top of your fans’ news feeds, giving more fans the opportunity to interact. Lonely Planet's fan-centered status update asked fans for their input. The 171 comments vaulted the update to the top of news feeds. If you’ve tried asking your fans for input but you’re still hearing crickets, it’s time to look back over your status updates and evaluate your posts. Are you posting more about your company or your community? Fans interact with Rosetta Stone's community-focused status update because it poses a question that resonates with the fans' interests. Too often, Facebook page admins create these gorgeous, highly functional tabs, but fail to include a call to action. It’s not just your status updates that are important; every bit of content on your page is important, and you need to get that content spread around Facebook. That’s why all of your content must be sharable. Omaha Steaks' share button allows subscribers to post the newsletter—and the exclusive deal—to their walls. All of your content can include a share button that encourages your fans to post that content to their walls. If you’re holding a sweepstakes, provide fans with a share prompt upon entry submission so that they can let their friends know they’ve entered your contest. When one person watches your video or enters your contest, that’s great. But if that fan tells their 200-plus friends about your content, that’s more clicks, more traffic and potentially more business. It doesn’t matter what the content is. If it isn’t sharable, it isn’t benefiting your page as much as it could be. 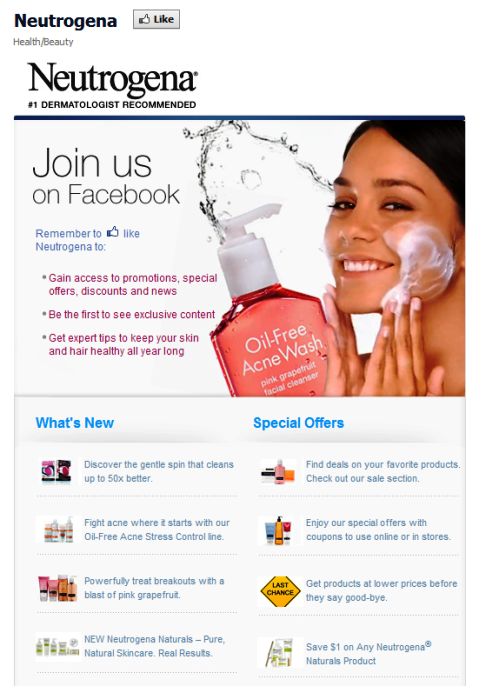 Your custom Facebook tabs are a great place for your newsletter or customer relationship management sign-up form. If you aren’t seeing the number of sign-ups you had hoped for, incentivize it. Remind your fans what is sent to subscribers (like coupons). It’s a great way both to populate your list and get your fans excited about your product or service. 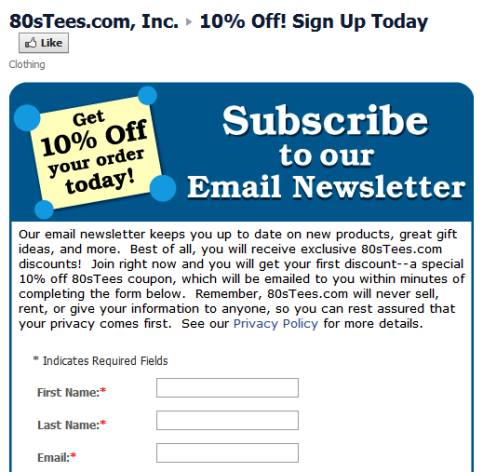 80sTees.com, Inc. drives newsletter subscriptions by incentivizing sign-ups on Facebook. Want to drive up your fan count and increase engagement at the same time? Create a custom tab with a fan-gated contest. Serve non-fans a message that tells them about the prize, but inform them that they have to like the page to be eligible to enter. Once the non-fan clicks Like, present an entry submission form that collects your targeted user data, whether that’s an email address or phone number. If you’re giving away something good, you’ll get the likes and you’ll get the data. However, it’s important to note that if your contest is on a welcome tab, don’t gate the whole thing. You don’t have to let non-fans be eligible for contests and promos, but you can’t hide all of your content from them. Neutrogena's welcome tab is perfect: it's fan-gated, incentivizes liking the page and includes lots of information for non-fans who may not want to click Like. The more content you gate—the more abandonment you’ll see. All of these steps revolve around fan-centric content. While this looks different from brand to brand, the first step in successfully creating a call to action is to put yourself in your fans’ shoes. So ask yourself—Why do they like my brand? My page? What do they all have in common? What interests do they share? Answering these questions will help you find your starting point. What do you think? What are you doing to increase your fan engagement? Leave your questions and comments in the box below.